Voice Cash Pro review - Scam? NO ONE TOLD YOU THIS! Home > Online opportunities > Voice Cash Pro review – Scam? NO ONE TOLD YOU THIS! Wondering if voiceprofitsystem.com is a scam? Or will this system make you the kind of money you deserve? First of all, I must congratulate you for taking the time to do your own research before buying into another money-making program. There are sooo many frauds out there, so doing your due diligence is the way to avoid scams and find the proven method to earn passive income online! When it comes to Voice Cash Pro, the truth is that it’s not as awesome as portrayed in the sales video. This honest review will show you how this system really works, the red flags I found and other things you need to take into consideration to make a wise decision. 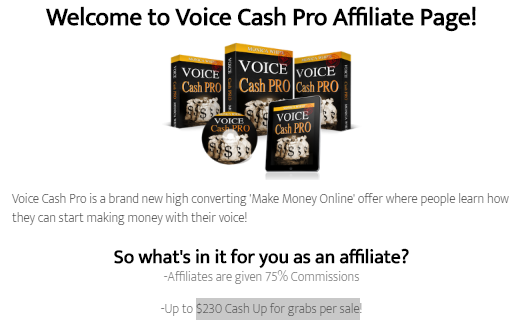 2 What is Voice Cash Pro? 3 How does Voice Cash Pro work? 3.3 Can we even trust Monica? 4 Is Voice Cash Pro a scam? Someone sent me an email concerning this new product, so I thought I would check it out to see if it would be legit or just another scam to avoid. The second I landed on the Voice Cash Pro sales page, I thought I was in front of another scam because of the outrageous claims. The spokeswoman, “Monica”, claims it’s possible to make $1000 in just 30 minutes, which makes this program sound like a get-rich-quick scheme. She says that making money online has never been so easy and simple, but I have to disagree. Earning money online is not as easier as she makes it sound because if it was, don’t you think a lot of people would quit their 9 to 5 jobs? This is said to be a new, easy and interesting way to generate cash online, but in reality it’s nothing new. Then, “Monica” starts talking about her story. She supposedly was struggling because her husband had cheated on her and she needed a lot of money to save her son, , but then she met an old friend who shared with her a 3-step system that she was using to make $15,000 in 2 weeks. This “system” is about making money for doing voiceovers and is supposed to be a way for you to start making money by the end of the day. She claims you don’t need any special skills or prior experience, and it doesn’t matter how your voice is to get started. Everything she says sounds amazing because it makes it seem very easy to start making a full-time income online. For example, when she got started she apparently made $450 for the first voice recording she sent to an education company. So will this system make it possible for everyone to make a living online? Is it that easy to make money with your voice? We’re shown some people who have supposedly earned thousands of dollars thanks to this system, so it’s easy to get excited and think that this really works. But the truth is that the sales video is full of fake claims and misleading information, which is something that I’m going to show you in the next section. Set up everything by following simple step-by-step instructions. Spend 1-2 hours a day on your smartphone or laptop. Sit back, relax and enjoy the payments you receive. It sounds too simple, don’t you think? I mean, she doesn’t even say how long it’s going to take you to get everything set up. And she doesn’t even mention anything about the voiceover industry. So, the only way for you to know what you’re really getting into is to buy Voice Cash Pro. They don’t provide any information about the training you will get, which is a red flag because knowing what you’re getting for your money is the way you can determine if this is worth it. Voice Cash Pro doesn’t work in a way that you can a lot of money in a short period of time. The truth is that you’re not going to get a system that allows you to make money on complete autopilot or without doing much work. It’s completely possible to make money as a voice over artist, but it’s not as easy as they make it sound. In the sales video, you’re told you can get paid for doing voiceovers for video games, audiobooks, commercials… and it’s true. But you cannot expect to make money the first day you get started because no one will know you. In other words, you need to market yourself in freelancing sites and build a personal brand in order to get good clients. No matter the kind of business you start as a freelancer, let it be writing or voiceover, you need to find a way to get seen! You cannot expect to just start out and quickly have projects requested because there are competitors who have way more experience than you, so they’re more likely to get hired than someone who’s just getting started. That’s why you need to acquire some experience and learn new skills before reaching the point where you’re making a full-time income. This is something that applies to all businesses. Just because it’s online, there are no special methods that you can use to make thousands of dollars in no time. Making money online is like making money offline because it takes time and work. Another thing you need to consider is that the training they provide you with is more than likely basic because that’s the trend with this kind of products. Just the fact that they don’t tell you what you will find inside the members area is a red flag because it indicates that they first want your money. If they really wanted you to do what’s best for you, they would give you more details about the training. They know that if you knew the kind of training they provide, you would probably not purchase this product. I mean, why purchase something when you can find it for free? What about the people who appear in the sales video and claim to be making thousands of dollars in a short period of time? I’m sorry to say this, but they’re not real members. They’re not making money thanks to Voice Cash Pro because they haven’t even bought it. In other terms, they’re fake testimonials and I know this because I recognized their faces as they have appeared in other scam videos. For example, Matt is not really Matt, he’s a Fiverr actor who has got paid for his testimonial. So there’s no one who has benefitted from the training provided in Voice Cash Pro. If there were real success stories, don’t you think they wouldn’t have had to pay these Fiverr actors to get positive reviews? Not only that, Voice Cash Pro has recently launched so it’s too soon for members to achieve success. There’s no such thing as overnight success so that’s another way I know that all the testimonials are fake. Can we even trust Monica? We’re told that Monica White is the woman behind this program, but how can we confirm this is true? I mean, she doesn’t show any picture of herself and she doesn’t give us any contact information. There are successful voiceovers who have websites or YouTube channels, but Monica doesn’t mention anything of this. That’s why I suspect she’s as successful as she claims to be. I personally don’t believe she’s the real owner of Voice Cash Pro. I have reviewed lots of products like this and I have realized that many of them are promoted under fake names. The real owners don’t usually show up because that’s the way they avoid getting persecuted by people who feel ripped off. Scammers hardly ever reveal their identity because that’s how they can keep creating different scam products. Something you need to know is that $37 is not the real cost of this product. If you decide to purchase it, you can expect to get bombarded with some upsells. I know this because they say that affiliates can make up to $230 per sale, which means that they will try to get you to spend hundreds of dollars on additional products. That’s something they don’t tell you that you need to know to make sure this business is right for you. The sales video for Voice Cash Pro makes this product look like a scam because it makes this look like an easy way to make a lot of money online. You cannot expect to earn money the same day you get started because there’s a lot you need to learn and you also need to acquire some experience and skills. I personally don’t like the lies and deceit they use to convince you to purchase this product because that’s the way to make customers feel ripped off or disappointed. People who have bought Voice Cash Pro and haven’t made money overnight will probably call it a scam, since they had bought this product expecting that they could profit fast. Other people will not call it a scam because you get something for your money. Even though there’s a lot information you can find online for free, their training might save you some research time so that’s the reason it’s not a complete scam. In my opinion, this is not 100% scam because it’s sold on ClickBank, which means that you can get your money back if you buy it and end up not liking it. So, you are free to do whatever you want at the end, but I do not recommend Voice Cash Pro. There are various ways to generate a full-time income online, but I have realized that the best way is to build your own online business. I’m grateful that I found a newbie-friendly business model that has given me a way to make a 4-digit monthly income online. It’s a business model that makes it possible for you to make passive income and work from anywhere as long as you have a computer and an Internet connection. It’s not like a voiceover business because you’re not required to spend money on tools like studio headphones or microphone. In fact, I don’t have any of those tools and I’ve been able to make this business model work for me. Instead, this business takes advantage of many of the products/services that are available online so you don’t need to spend time on creating your own product. With that said, I want to make clear that this business takes a lot of work and time to make it profitable, but this is just like anything you want to achieve in life. Before checking out my free guide, note that this is only for people who are committed to putting in the effort and time. Best part is, you will be able to start today for free! That’s right, you can check it all out without spending a dime so ensuring that this business is right for you is risk-free! Not only that, you also get the chance to receive free help and support from me and other Internet entrepreneurs =) You will love how supportive the community is, there’s always someone willing to give you a hand! So what about you? Will you get on the right track to building your passive income stream today? 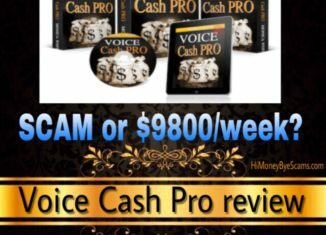 I hope this honest Voice Cash Pro review has been helpful to you and you will make the best possible decision. AmazonRecruiter.org SCAM – Review exposes this FAKE Amazon job! Digital Formula scam – Review exposes the HIDDEN TRUTH! Is El Bandito by Brendan Mace a scam? UGLY TRUTHS revealed!